No one likes bad news, and no one likes to be the one to deliver it. But sometimes you just don’t have a choice. Sometimes you decide it’s time to change course and go down a different path. If you’re pregnant and were considering adoption but are now having second thoughts about your plan, you may find yourself in this position. Until recently you might have fully intended to go through with your plan. But then something happened, things changed, and now you’re not sure you want to go ahead with it any more. Maybe you thought that you weren’t ready to care for a child on your own but now you realize you are. Maybe the baby’s father has come back into the picture and offered to help you raise her. Or maybe your parents have promised to help you out even though earlier they said they wouldn’t. Whatever the reason, changing your mind is not only an option. It’s your legal right as an expectant mother. After all, it’s your baby and her interests come first. Regardless of what kind of adoption plan you made or how committed you were to it, you have the ability to change your mind at any time before signing the relinquishment papers. But that doesn’t make it any easier if you’ve already chosen a family to raise your baby and gotten to know them. For many women in your situation, telling the prospective adoptive parents that you’ve changed your mind is almost as difficult as choosing them in the first place. Here are some suggestions to make it easier. Changing your adoption plan is a life-changing decision not only for you, but also for the adopting parents. Before you deliver the news to them, think hard about it and make sure you feel confident about it. If the prospective adoptive parents sense that you’re wavering or have mixed feelings about your decision, they may try to talk you out of it, which could make the situation harder for everyone involved. Once you’ve made your decision, stick to it. Don’t let the adopting parents or anyone else pressure you to go back on it. Because there’s no easy way to deliver bad news, make sure that you know what you want to say beforehand. Treat the adoptive parents with dignity and respect, but also be firm and direct. Don’t beat around the bush or leave them guessing about what you mean. Rehearsing your message and anticipating their responses to it ahead of time can help you refine it and reduce the chances of things going awry. 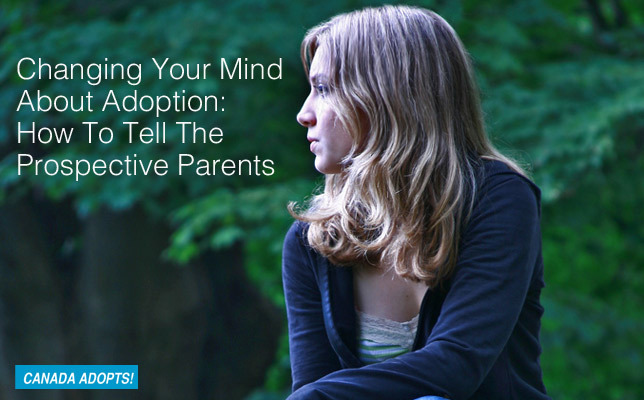 There are many ways you can tell the prospective adoptive parents you’ve changed your mind. But one thing you don’t want to do is just blurt it out or make it look like you’re rushing through it. Let them know that you’ve given the topic a lot of thought and why you believe it’s the best option. Keep your message short. The less you say, the better. Explain how you came to your decision, but don’t go into every detail. You want to stay calm and in control, and avoid the discussion from getting heated. If there’s an upside to your decision for the adopting parents, be sure to mention it. Even though there’s never a good time to deliver bad news, sometimes are better than others. Pick one that works for you and the prospective adoptive parents, that’s free of distractions or interruptions, and give yourself enough time to fully address the issue and for them to absorb it. Don’t wait until the end of the conversation and then casually slip it in. The adoptive parents won’t be happy to hear what you want to say, but they will respect you for having the courage to come forward and level with them. Delivering the news to the adoptive parents in person is best. But this may not be possible to do, either because you live far away from each other or you don’t feel up to facing them. If that’s the case, you might want to do it by phone or Skype. The advantage of doing it by phone is that it’s more personal and immediate, and it will give you a chance to answer their questions, without having to look at them in the eye. Skype is good, too, but it’s more direct and you may not feel comfortable with it. Email is another alternative. And although it’s not ideal, it definitely better than sending a text message. The more direct you are with the adopting parents, the easier it will be for them to process your news and the sooner you’ll both be able to move on with your lives. Depending on what kind of relationship you have with the prospective adoptive parents, you may feel like you owe them an explanation. Over the last few months you may have shared a meal with them, met their families, gone to doctor’s appointments or picked a name together, which may make you feel obligated to delivering the news yourself. No doubt they would appreciate hearing it from you. However, if you feel awkward or are concerned about how they’ll react, you can get your adoption worker to accompany you or have her or a close friend do it for you. No matter who delivers the news to the adoptive parents, whether it’s you or someone else, the main thing is that someone needs to do it. And the sooner the better. Don’t sit on it and wait for the right moment. You could be waiting a long time. The prospective adoptive parents also need to go on with their lives and be able to plan for the future. Breaking up is always hard to do, there’s never an easy way to do it. But putting it off will only make a stressful situation more stressful, especially as you move closer to your due date. Placing a baby for adoption is a difficult decision, and so many things can change from the time you first created your plan. If you’ve bonded with the adoptive parents and watched them invest themselves into your relationship emotionally and financially, you’ll worry about hurting them and feel badly about your actions. And there’s no way around it: they’ll take the news hard, even if there were signs that things weren’t going well on your end. But keep in mind that you haven’t done anything wrong. There’s nothing to feel guilty about. As difficult as it will be for them, the prospective adoptive parents went into the process knowing that this was one of the risks. And while that doesn’t make the situation any easier for you, as long as you’re sincere and forthright with them you have nothing to be ashamed of. Changing your mind about placing your child for adoption is a difficult decision, but it’s one of your rights as an expectant mother. Although delivering the news to the prospective adoptive parents will be difficult, it’s important to put your child’s needs first and to deliver the news as honestly, directly and quickly as you can.